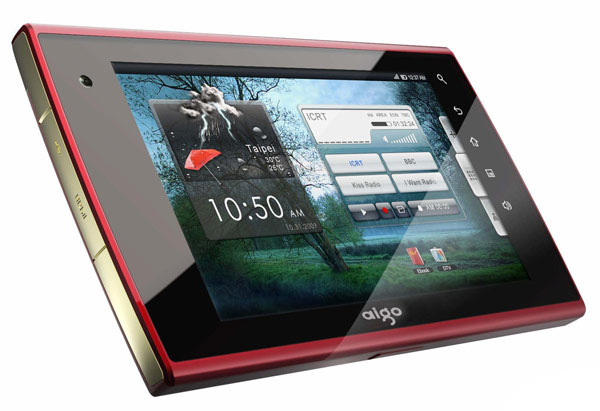 Aigo/Paroit have just launched their new range of tablet PC’s, which range in size from a 4 inch screen up to the N700 equipped with a 7 inch touch screen (pictured below). Built on a Dual core Cortex A9 1Ghz (1MB L2 cache) processor this tablet is definitely well equipped contender and tablet alternative to the iPad. Including: 512MB of DDR2 memory, an 800 x 480 pixel multi touch display, 4/16/32GB of inbuilt storage, a USB socket, microSD slot, HDMI output, inbuilt WiFi, optional 3G WWAN, audio in / out and a 3,120mAh battery. Running Android 2.1 it also supports Flash 10.1 and is able to access to Kaixin, play QQ games, ebooks, online magazines, reads MS Office files, push email stream video, comes with a Docking Station, and is Plug-n-play. Disappointingly there are no details on price or a possible launch date at the moment. Have a look and our article on Android vs iPhone to see which smartphone and mobile platform is best for you.